Kingston Digital Corridor in partnership with the city of Kingston, New York announces a new tech-friendly initiative designed to grow the city's booming creative-tech entrepreneur community. Kingston, N.Y. (PRWEB) March 31, 2009 — If Kingston, N.Y., the State's original Capitol located just 90 miles north of Manhattan, had a Statue of Liberty in its Rondout Harbor, it would read "Give us your geeks, your digerati, your cyber masses yearning to breathe free." An influx of digital entrepreneurs, or "technopreneurs," is transforming Kingston into a center for like-minded, technologically-forward small business owners, creating a new economy for this historic city. Documenting and promoting Kingston's digital revolution is a new organization, KingstonDigitalCorridor.org. The non-profit, grassroots organization's president Mark Greene, owner of Emmy Award-winning Pecos Design, says that technopreneurs have grown to such numbers in Kingston that they are becoming one of the small city's largest industries. "Kingston's collective of technopreneurs is staggering," says Greene. "We estimate more than 500 spread out along the Uptown to Downtown corridor. Our group was established to bring attention to this industry, to promote an atmosphere of collaboration among our members, and to share the secret: Kingston is THE place to locate your tech-based small business." A combination of many desirable factors has brought this new breed of small business owner to Kingston, which sits nestled between the Catskill Mountains and the Hudson River. The proximity to New York City makes it easy to service clients remotely and in person. Housing and commercial building prices are extremely low compared to the inflated prices found in Manhattan, Brooklyn, and the other boroughs. Since these businesses simply require an office and an internet connection, many space options are readily available that can accommodate them. And for those still looking to enjoy the cultural aspects of city living, Kingston offers a wealth of art, music, events, restaurants, cafes and other gathering spots that bolster a sense of community. The new Kingston Digital Corridor (KDC) organization is a private and public partnership between active citizens, the City Council and Mayor James Sottile. Over the last five years, Kingston has become a sought-after destination for programmers, animators, web content providers, video editors and a wide range of other digital contractors and micro businesses. KDC will encourage interaction between this disparate group of individuals while fostering an atmosphere that attracts others from outside the region to relocate within the city limits. "Kingston has Emmy and Grammy award-winning micro-business owners living and working right here," Mayor Sottile told the Council recently. "This new effort will enhance our art-friendly atmosphere and mix a perfect blend of art and technology in a small city environment." Kingston's digital economy has been growing for many years and has recently seen a further uptick due to the global economic downturn. "As companies lay off permanent staff during this crisis they are turning to independent contractors to meet their marketing and creative needs," says Greene. He adds that Kingston's digital trend hasn't just begun, but is in full swing. "With the opening of the 721 Media Center two years ago and the voter-approved plans to convert the historic Carnegie Library into a digital learning center, Kingston is building the kind of brick and mortar assets that anchor a tech-friendly community. KDC is shining a bright light on an industry that has been established here for years, but has been mostly unknown because the businesses involved have one, two, maybe three employees." Greene explains that incorporating these businesses into a collective force represents a significant influence in the city. "KDC members are typically young professionals who buy or rent homes, contribute to the local retail economy, are active in social and community activities, and become part of the pulse of the city," says Greene. In addition to producing events that promote the collaboration of technopreneurs in the region, KingstonDigitalCorridor.org organizers will stage a "siege" on Brooklyn in the coming months, chartering a bus to "capture" some interested technology-based small business owners and bring them to Kingston. Visitors can expect a tour, a party, and some inside information on Kingston real estate deals. A "Fast Track KDC Approved" real estate package, created in cooperation with public and private partners, will be rolled out April 8th at Kingston City Hall. The package connects prospective commercial and residential buyers with real estate agents and lenders who understand the finances of tech entrepreneurs. KingstonDigitalCorridor.org is a non-profit, grassroots organization for the thriving community of creative digital entrepreneurs who live and/or work along the Broadway corridor in Kingston, New York. Over the last five years, Kingston has become a sought-after destination for programmers, animators, web content providers, video editors and a wide range of other digital contractors and micro businesses. Because of the urban feel and wealth of architectural, cultural and natural assets, Kingston is becoming known as "Brooklyn on the Hudson." And it's fast becoming the destination of choice for New York City digital entrepreneurs looking to move north and enjoy the natural wonders and cost savings of the Hudson River Valley. Keep the systems you have running and delay the purchase of new computer hardware. Use a well designed, time proven service and support model to extend the life of your current systems and save money at the same time. (Vocus/PRWEB ) March 31, 2009 — Maintech, a leading IT Infrastructure Services provider, has developed a program that can help customers get more mileage from their existing IT Infrastructure through a well managed services and support program. Being a vendor neutral, multi-platform capable services provider, Maintech has service agreements with most of the large computer equipment OEMs. Through these relationships and drawing on over 35 years of infrastructure service experience, Maintech can help customers continue to utilize their current installed base of systems. Delaying the purchase of new hardware during these difficult economic times, companies can use their capital for other purposes and extend the usefulness of their current infrastructure. The support and services programs that Maintech has developed can be custom tailored to meet each client’s specific needs and in most cases, Maintech can take on the support within 45-60 days. If you are looking to limit the purchase of replacement hardware and want to understand more about what Maintech can do for you, contact Bill Rudowitz at 973-330-3277 or via email at Wrudowitz@maintech.com or visit the website at www.maintech.com. Maintech is a division of Volt Delta Resources, LLC, which is wholly owned by Volt Information Sciences, Inc.
New webdirectory Repair4Printer recently launched its collection of do-it-yourself guides for printer repair and modding. A wide array of tips, tricks, and pointers are available for any printer make from dot matrix printers to today's latest models. (PRWEB) March 30, 2009 — Repair4Printer (http://repair4printer.org), the new webdirectory dedicated to do-it-yourself printer repair and modding how-to, is the Internet's most comprehensive and extensive collection of repair and renovation guides. The helpful directory offers a host of free tips, tricks, and pointers for almost any printer model from ancient dot matrix printers to ink printers, thermo printers and laser printers. Valuable guides found on Repair4Printer give step-by-step assistance in fixing almost any kind of printer trouble, including how to mend a blown fuse, clean a dusty case, fix a broken heater, and much more. All guides are free of charge and are written by computer hackers, tech addicts, and software experts from around the world. Conveniently housed online, these guides are often able to substitute for a missing or expensive service manual. Want to conserve ink or toner in order to save money and protect the environment? Guide topics range from modifying ink cartridges to best practices when re-filling used toner boxes. Whatever the problem may be, Repair4Printer is sure to have at least one guide to point readers in the right direction. The Repair4Printer webdirectory even features a special section that addresses self-made printers and plotters, including models made from Lego™, Fischer-Technik™, and several other brands and 3D printers. Computer connectivity is often times a frustrating and confusing element to printers. Repair4Printer incorporates guides devoted to all different connectivity techniques: parallel, serial and UBS ports, infrared, wireless and Bluetooth™ connectors, network cards and SCSI, and more. Here, you'll find advice and instruction on how to maintain and repair these ports. For readers who need general help with computer repair techniques, Repair4Printer offers a generic HOW TO and FAQ section full of resources and guides for soldering, chipset, pinout, connector and electric circuit specifications, and more. Still need more help? If it's not on Repair4Printer, users will find links to newsgroups, mailing lists, and forums designed to offer further technical assistance. For more information on Repair4Printer, please visit http://repair4printer.org. BOSTON and WASHINGTON, D.C. –March 24, 2009 . OnForce, the trusted online marketplace and nationwide network of thousands of technology service professionals, today announced a strategic partnership with the Satellite Broadcasting and Communications Association (SBCA) of America, the leading trade organization representing all segments of the satellite technology industry. As part of the alliance, OnForce's network of more than 12,000 information technology (IT) and consumer electronics (CE) service technicians (OnForce Pros) will be invited to complete the SBCA.s industry-leading certification program, thus promoting the highest standard for the installation of satellite products and services. OnForce Pros will also be encouraged to join the SBCA and take advantage of their numerous member benefit programs including educational discounts, monthly newsletters, legislative updates, and group insurance programs. SBCA member companies will be encouraged to join the OnForce professional network and take advantage of their wide array of service work opportunities. Additionally, consumers and organizations will have an easier time accessing their trusted OnForce professionals for satellite technology-focused contracts. We are pleased to be partnering with the SBCA, the standard of excellence in satellite technology to continue to provide our valued solution providers with the highest skilled service professionals in the industry, especially when it comes to satellite technology,. said Peter Cannone, CEO of OnForce. .With the digital TV transition and lower prices for flat-panel TVs, we are witnessing significant demand for onsite installation services in the satellite technology sector and OnForce, as always, is poised to help meet reception and high-definition programming needs. The SBCA prides itself on providing excellence in the delivery of satellite technology and our National Standards and Testing Program Certification, backed by DIRECTV and DISH Network, provides an industry-endorsed benchmark of knowledge for the installation of satellite products and services,. said Steve Hill, Deputy Executive Director, SBCA. .The SBCA certification means that the service professional have undergone stringent performance tests and we know that given OnForce's reputation for quality, this partnership is a natural fit." OnForce is committed to providing its service professionals and buyers with leading IT skills and expertise. OnForce service professionals are certified in more than 140 different programs, including CompTIA A+ and CEDIA Certified Professional Installer. SBCA certification will be available on OnForce.s website on March 29. OnForce is service made simple. Our marketplace provides access to national network of over 12,000 local service providers connecting service demand with local supply through a powerful online marketplace . easily, efficiently and profitably. Our marketplace has sophisticated tools that enable service provider to find, match, deploy, and pay the right technician for the right job, on demand. OnForce marketplace also offers a new model for managing all your service events while containing costs or growing your offerings. Nearing one million completed service orders, OnForce is a proven leader in helping service buyers increase profits, gain a competitive advantage and contain service costs. The OnForce network is made up 5,000+ IT and CE service buyers and more than 12,000 service technicians who work in a number of technology categories, including computers, printers, networking, VoIP, point of sale and consumer electronics. For more information, visit www.onforce.com . The Satellite Broadcasting and Communications Association is the national trade organization representing all segments of the satellite industry. It is committed to expanding the utilization of satellite technology for the broadcast delivery of video, audio, data, music, voice, interactive, and broadband services. Additional information can be found at www.sbca.com . This week we are going to talk with The VAR Guy and ask him where he thinks the industry is headed. Part 4 of a 4 part series. Apple released Safari 4 beta to the public February 24. Safari 4 beta can be downloaded from http://www.apple.com/safari/download/. The winner of the Technibble contest is Michael Murray of Bartow Onsite Computer Solutions. Congratulations, Michael! The prize is The Computer Business Kit from Technibble. If you would like a copy of The Computer Business Kit, it is $49 and it can be purchased directly at www.technibble.com. Microsoft released Windows Vista Service Pack 2 Release Candidate to the public March 4. In episode 29 we talked with Pat Palmer, heard how his business is doing well in spite of the economy and how he expects this trend to continue in the months and years to come. In episode 30 we talked with Kris Crispell and he told us the same thing. In episode 31 we talked with Crisantos Hajibrahim of Virus Woman. He told us why he entered a new and growing area of the IT market to keep his business profitable, heard how he did it and found out how he is riding out the economic storm – in the cloud. This week we will talk with The VAR Guy and find out where he thinks the industry is headed. Part 4 of a four part series. In episode 29 we talked with Pat Palmer, heard how his business is doing well in spite of the economy and how he expects this trend to continue in the months and years to come. In episode 30 we talked with Kris Crispell and he told us the same thing. In episode 31 we talked with Crisantos Hajibrahim of Virus Woman. He told us why he entered a new and growing area of the IT market to keep his business profitable, heard how he did it and found out how he is riding out the economic storm â€“ in the cloud. This week we will talk with The VAR Guy and find out where he thinks the industry is headed. Part 4 of a four part series. Washington, D.C., March 10, 2009 While information security remains a top priority for eight in ten IT professionals surveyed, many companies seem to be underestimating one of the most significant IT security threats – end user error. According to CompTIA's 7th Annual Trends in Information Security survey, human error is the primary cause of the most severe security breaches, yet significantly fewer organizations (45%) provided security training for their non-IT staff in 2008 compared to 53% in 2007. The results of study will be released and presented at the FOSE tradeshow in Washington D.C.
"Fueled in part by the rapid adoption of portable hardware like laptops, flash drives and smart phones, and by distributed information technologies like crowd sourcing, social networks, virtualization and cloud storage, end users are exposed to new IT security threats every day," said Tim Herbert, vice president of research at CompTIA. "Security threats grow along with the expanding reach of IT so non-IT employees need to be continually trained on the latest IT security threats." Terry Erdle, senior vice president of skills certification for CompTIA will present the detailed results of the study including the top five security issues across the IT landscape, how costly security breaches can be to a whole organization not just IT, and insights on how to lower your risk on Tuesday, March 10 at 2:20 p.m. in Theater 1 of the Walter E. Washington Convention Center in Washington D.C. as part of FOSE, a major federal IT tradeshow. "Unintentional security breaches by non-IT staff cost companies thousands of dollars in lost productivity and business downtime," said Erdle. "This demonstrates a need for more employee trainings and deeper knowledge of technology functions." In addition to comprehensive industry research, CompTIA offers many other programs related to IT security including a new Security Trustmark accreditation that establishes security best practices for IT solution providers. CompTIA's 7th Annual Trends in Information Security: an Analysis of IT Security and the Workforce was fielded to a sample of 553 US IT professional via the Internet during January 2009. The international portion of the study was fielded to a sample IT professionals in key markets around the world. The complete study is available free to CompTIA member companies at www.comptia.org/research . For more information on the study, on CompTIA's certifications, or CompTIA's other work on behalf of the global IT industry, visit CompTIA booth 2209A on the FOSE show floor or navigate to CompTIA.org. CompTIA is the voice of the world's information technology (IT) industry. Its members are the companies at the forefront of innovation; and the professionals responsible for maximizing the benefits organizations receive from their investments in technology. CompTIA is dedicated to advancing industry growth through its educational programs, market research, networking events, professional certifications, and public policy advocacy. For more information, please visit www.comptia.org . RENO, Nev. (Feb. 24, 2009) – Global system health and computer diagnostics leader PC-Doctor Inc. today introduced its PC-Doctor Service Center 7 computer repair kit, a significant advancement of the industry's top PC troubleshooting software used by service organizations, independent PC repair professionals, small manufacturers and others. The latest kit delivers new and faster diagnostics, more advanced test scripting, a significantly improved POST card for systems that won't boot, a drive-erase tool, and the ability to take detailed snapshots of the system under test to clearly show all changes made. Additionally, companies using Service Center 7 can present a professional image to their customers by providing customized test reports that include the company's logo, contact information, and technician name. "Technicians who choose PC-Doctor Service Center 7 are able to take advantage of the same up-to-date professional diagnostics that four of the world's top five manufacturers pre-install on their PCs to reduce warranty and service delivery costs," said Doug van Aman, the company's chief marketing officer. "We routinely develop tests for new hardware well before those technologies are released to the general public, and are able to roll those advances into PC-Doctor Service Center, while continuing to support legacy systems." Service Center 7 comes complete with more than 300 diagnostics, including high-level diagnostics for testing hardware and advanced drivers within the Windows operating system, and bootable diagnostics for low-level, direct testing of hardware, and for use when Windows will not boot. The new Windows tests support the latest components introduced by the world's leading manufacturers, including newly introduced video cards, Bluetooth network devices, CPUs and Blu-ray optical drives. Additionally, the bootable diagnostics include new, faster protected-mode memory tests that are based on PC-Doctor patents and capable of testing up to 64 gigabytes of memory. Customizable reports: The computer repair tech has unprecedented control over both the content and the appearance of the reports generated by Service Center 7. These reports can be branded to include the company name, technician name, and the company logo, and can include system information, test information, and comparisons between system snapshots, showing hardware and driver changes that occurred during repair. System snapshots: Techs can take a snapshot of the system before they start repair, run diagnostics and replace hardware or make driver changes, then take another snapshot. All differences in the two sets of system information will be listed, including detailed hardware and driver information. The tech can include this information in the report given to the customer, allowing the customer to clearly see exactly what was done on their system. This establishes credibility and boosts customer confidence. Drive-erase capability: Our new tool wipes a hard drive to U.S. Defense Department specifications. SMART attributes log view: Shows all of the details from the drive SMART function. Support for CD/DVD checksum test: New test media supports this test while maintaining compatibility with older-version media. Test automation: Five predefined, broad-coverage test scripts are available directly from the home screen, as are up to five user-defined scripts. Redesigned user interface: The completely redesigned user interface provides much faster, cleaner access to all Service Center 7 features. Customizable links: A nearly unlimited number of links to user-defined test scripts, favorite Web addresses, and local files can be added to Service Center 7 for quick access when running on multiple systems. The top five links are also available directly from the home screen. Periodic updates: Customers may subscribe to receive updates to the diagnostics. a professional canvas case for carrying the kit onsite. 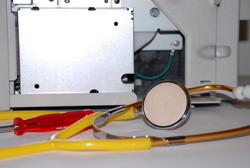 Founded in 1993, PC-Doctor Inc. develops diagnostics and other system health tools that help PC makers, service centers, and IT organizations reduce costs, improve quality and enhance customer satisfaction. With more than 180 million units shipped worldwide, PC-Doctor's diagnostics are pre-installed on systems from four of the world's top five PC manufacturers. In addition to Windows products, the company also develops diagnostics for Linux and other operating systems that run on leading Intel and AMD microprocessors. For more information about PC-Doctor and its products, visit www.pc-doctor.com or call (866) 289-7237. International customers should call (775) 336-4000. Barrister is frustrating service providers again and this time they are really ticked. Barrister Global Service Network, which claims to be “the oldest and largest woman-owned computer service company in the United States”, is a national contractor based in Louisiana. The company was founded 1972 and advertises a network of 15,000 techs on the roster who are independent contractors. The company is well established and is well known among field service technicians and IT consultants as a source of contract work. Barrister had a good reputation with field service technicians at one time, however within the last few years many service providers have complained about poor communication and slow or non-payment for services rendered. The payment issues were initially blamed on Hurricane Katrina, which wreaked havoc on the entire state in which Barrister is based and all but put the company out of business. However, three years later the company is back in business and seems to be a different company with a different attitude, according to some service providers. A few weeks ago Barrister surprised 15,000 techs on their network when they sent an e-mail outlining an new Quality Initiative Program. Effective Monday, February 16, 2009, we are going to be launching our Quality Initiative Program. This initiative will reward those technicians that show up on time for their ETA, perform quality work, provide updates and closing information from onsite, etc by sending them more work. With the Quality Initiative program we will begin to penalize those technicians that do not show up on time for their ETA, do not perform quality work, do not provide updates and closing information from onsite, or who turn back calls after accepting them. Effective Monday, February 16, 2009 any technician who is late for an ETA without notifying Barrister, or who doesn’t show up for an ETA will be charged a $100.00 penalty. As you may know, our competitors offer 100% money back guarantee to their customers in regard to the quality of the technician and the work performed. With today’s economy, we have to be more customer focused and more quality driven then ever before. Some techs are fed up. Many have stopped accepting calls from the company altogether. The response to the e-mail in tech forums was overwhelmingly negative. Although a few posted positive or neutral comments about their relationship with Barrister, most of them considered the new initiative an attempt by Barrister to circumvent or avoid payment for contract work altogether. This was understandable, since some of them were still waiting for payment for jobs performed months earlier and at least one had been stiffed completely. I received an e-mail from tbird635 that summed it all up. He then pointed out another line in the Barrister e-mail that he found ironic. “If I were running late, and knew I was going to get nailed for that $100, I’d turn around and go home and return the favor by giving them an unfinished (and unbillable) job. as well as a P-o’ed customer (who may then seek an alternative to them). Barrister is listed in The Force Field National Contractor directory under Barrister Global Services Network, Inc.. Members of The Force Field who have performed work for Barrister can rate the company and leave comments in the listing. I called Barrister today to get their side of the story. After explaining to the operator who I was and what I was calling about, I was placed on hold for 10 minutes until someone audibly hung up the phone.